We provide per-country SMS notifications through twitter. Message and data rates may apply. Create a Twitter account. If you already have one, skip this step. Login to Twitter and add your mobile number to your account. Click here to do that. 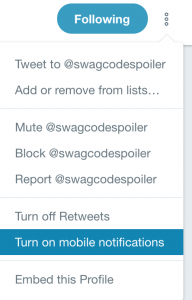 For US codes, follow @SwagCodeSpoiler. For other countries, see the table below. That’s it! You should start receiving texts when we announce codes. To unsubscribe, simply unfollow us on Twitter. For additional support or for more information, please visit twitter’s support page. Email notifications are generally less reliable than any of the above. You can receive email notifications by joining our Google Group. Subscribe by clicking the button below. 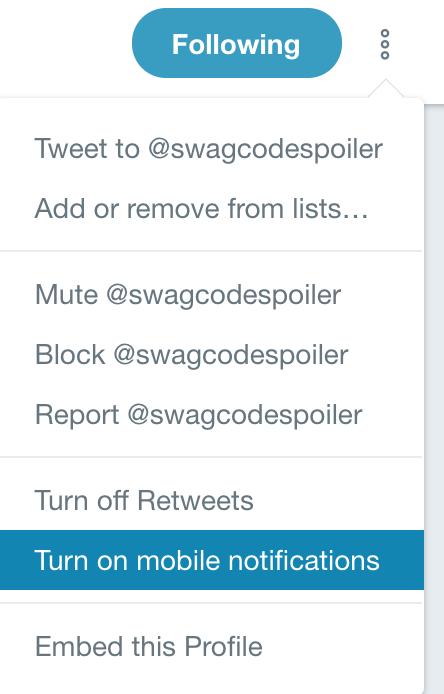 If you see a prompt that looks like the screenshot below, make sure to set “Email delivery preference” to “Notify me for every new message”!